Batch Picture Resizer is a software developed by SoftOrbits which brings its assistance in the optimization of the user's hard disk. It enables to lightweight images by converting them. Resizing: Via the "add file" option in the interface, the software enables to import images from the library. It offers the possibility to add multiple images to be resized simultaneously. The user has to adjust the output format and resize the images. 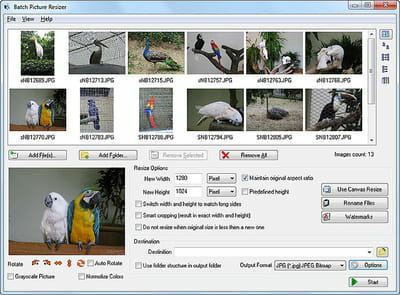 Conversion: As a multi- tasks software, Batch Picture Resizer has the ability to convert images. It supports many types of formats such as GIF, TIFF or JPG. It is also possible to convert many files at once. Customization: This utilitarian offers the possibility customize some settings to improve the rendering quality. For that, the user will be able to change the color, contrast or grayscale. Thanks to various given effects, the user can make each snapshot original. 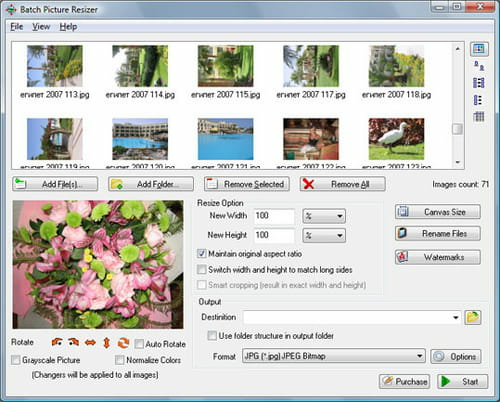 The software gives the possibility to rename multiple images at the same time. This is a trial version of Batch Picture Resizer. Latest update on July 14, 2015 at 03:17 AM.